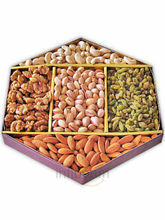 Healthy yet Tasty Dry Fruits Gifts! Want to boost your immune system? 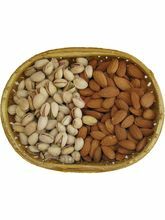 Dry fruits is your best bet! They are rich in proteins and minerals. Eating them on a daily basis, will regularly provide innumerable health benefits. Right from your skin to other health benefits, dry fruits give you every reason to include them in your diet. Ask any diet specialist and they will tell you how important it is to have dry fruits on regular basis. 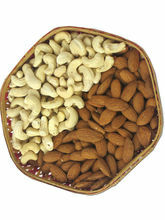 There are a number of dry fruits that you can include in your intake. 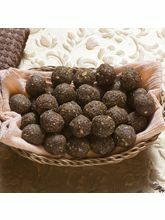 Some of the fruits that we have at Infibeam are almonds, cashews, pistas, mixes etc. At our online store, we have dried fruits gift that you can get at an incredible price! We have separate baskets of almonds and cashews that make good gifts too. Also, these baskets are best suited as Mothers day gifts, to recollect those beautiful memories when your mother used to add these dry fruits to your milk to make it flavoursome and healthy. 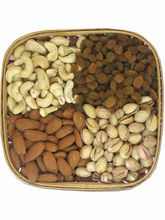 If you are looking for mixed dry fruits online India, then you are at the right place! 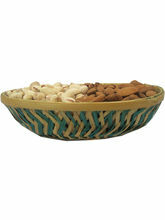 Infibeam's offers you with great deals of mixed dry fruit baskets online. In these baskets you get the best variety of cashews, almonds, pistachios, raisins, anjeer, roasted cashews, masala cashews, green chilly cashews, salted almonds and dry apricots. 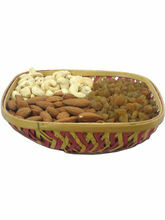 These dry fruits baskets come in different sizes with different quantities. You can gift dry fruit baskets for various occasions like anniversaries, birthdays and weddings. When you shop with us you get free shipping and manufacturer's warranty. The payment gateway at Infibeam is a very secure one. We accept Debit and Credit cards, Net banking and cash on delivery. 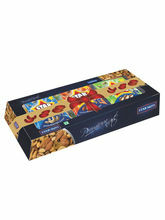 Come shop at Infibeam and avail amazing discounts and deals on dry fruits gifts baskets!